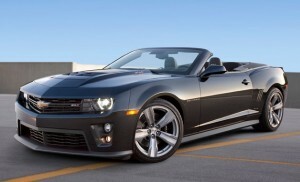 General Motors has announced that the world’s most powerful production droptop* – the 2013 Chevrolet Camaro ZL1 Convertible – will officially debut at the 2011 Los Angeles Auto Show in November. Like its coupe kin, the ZL1 Convertible will pack 580 horsepower and 556 pound-feet of torque from its supercharged 6.2-liter LSA V8, besting the Ford Shelby GT500 Convertible’s power figures of 550 hp and 510 lb-ft.
Good thing Ford is working on that all-new supercharged 5.8-liter V8 for the next-generation GT500. The horsepower wars are anything but dead.